Anthony Vandikas started his music lessons at the Yamaha Music School at the age of three. He was accepted into the Junior Music Advanced Course at the age of 6. He was later accepted into the Arts Baythorn program in Thornhill, where he started learning the french horn and played in the school's pit band orchestra for their yearly productions. He is a graduate of the Arts York program at Unionville High School, where he performed both as a soloist and a collaborative pianist. He also played the french horn in the school's Grade 9 Band, Concert Band, Symphonic Band, and Wind Ensemble. He has competed at the Canadian Music Competitions, both in the provincial and national level; the Ontario Music Festival Provincial Competitions; as well as various local festivals. At the age of 15, he completed his ARCT exam, attaining a First Class Honours with Distinction. Anthony completed his Licentiate Diploma Exam in August 2012, achieving a First Class Honours with Distinction and the 2012 National Gold Medal Award. His teachers include Janice Lin, Boris Lysenko, Sheila Vandikas (theory and composition), George Vandikas (classical and jazz music, brass instruments), Joe Ringhofer (theory and history), Dennis Chan (theoretical subjects), and Dr. Michael Esch (Licentiate Diploma). As a recipient of the Best Advanced Pianist Trophy, he was featured as a guest performer at the North York Music Festival. He has also performed as a guest soloist for the Tapestry Chamber Choir concert, and for VPAN's Young Artist Showcase (February 2013). In 2014, he won the Open Class at the ORMTA Music Writing Competition and was the recipient of the Eleanor Marzetti Scholarship. Anthony is a black-belt in Goju-Ryu karate. He is also enthusiastic about mountain-biking and has been a member of both the Newmarket Eagles Cycling Club and the Ontario Cycling Club. He also enjoys a variety of physical activities, including rock climbing, boxing, and shotokan karate. 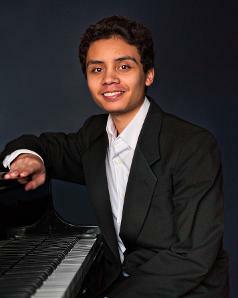 At our studio, Anthony teaches piano and theory from beginner to advanced levels. He works as a teaching and research assistant in the Computer Science Department at the University of Toronto and has worked on internship with IBM. Most recently, he completed recording the complete technically challenging Transcendental Etudes by Franz Liszt. Anthony has completed a Computer Science Specialist degree (with High Honours) at the University of Toronto where he received the distinction of being on the Dean's List of Scholars four years in a row. He is the recipient of yearly scholarships and has just recently completed his requirements for his graduate degree. He is currently pursuing his doctoral degree at the University of Toronto.